There are constantly more and more resources to help you learn guitar online, whether they be apps, books, DVDs, or games. On top of these resources is a fountain of YouTube videos with numerous people teaching a variety of topics about the guitar. This vast amount of information often leaves people overwhelmed and struggling to make any real progress on their own. We have had many students come to us with these problems. So we thought it would be useful to address some of the common reasons for why you may be struggling to learn guitar from YouTube or books. 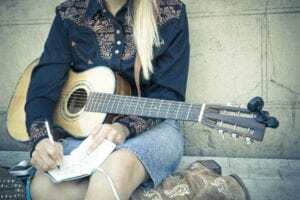 One of the most common problems with learning guitar from YouTube, books, or DVDs is that you do not get any immediate feedback or even no feedback at all. This lack of feedback is a problem. Even though you think you understand what the lesson or app is telling you to do exactly, you cannot see certain things that you are doing wrong. It is difficult for you to know whether what you are doing is correct or not. Technique is an important element when it comes to learning guitar. If a student learns the wrong techniques early on, it is much more difficult to correct that later. There is often only one way to do something correctly, and without feedback, it is difficult to know if you are doing it right. This problem is why you are often left wondering why you do not “feel” right when you play or why it does not sound right. Is the Person a Good Guitar Teacher or Is the Material Appropriate For You? Because of the easy access to the internet, it is very easy for people to start teaching guitar. However, they are not always good teachers even if they are good players themselves. Of course, we are not saying that all YouTubers are bad teachers. However, there are a lot of bad teachers out there. The second issue is that the material they are presenting may not be appropriate or right for you. Even if the presenter is a good teacher, how do you know the information she is providing is what you need to progress in your playing? Often, students who come to us who have been learning online—especially with less competent teachers, have many blind spots. Areas that they did not even know they had to learn to transform their playing. Once we work on those areas, their understanding and playing of the guitar accelerates. YouTube and books do not keep you accountable. It is easy to do something one day and give it up the next. Having a real teacher that you have to see person helps to ensure that you practise. When there is something hard to do, you can push through those challenges. If you do not understand something, a teacher is there to help you whereas it is much easier to give up if you are struggling by yourself. Most of the videos online and even books are very general, even if they state they are for beginner, intermediate, or advanced guitarists. The information provided is still for the general guitarist looking to advance. You are a specific person with your own goals and desires. What you want to play, your level of understanding, your level of motivation, and your challenges are very specific to you, which is why you need specific information to learn the guitar. Generalised information may get you somewhere, but it may not be where you want to be, and it will not get you the fast progress and results that you can get from specific information provided specifically for you. During different points of your learning, you will definitely have questions regarding your playing, and you may not even be able to describe your problems. Being unable to articulate a problem is an issue that we commonly see with our students; they have to SHOW us their problems through playing, which is often very difficult to do with online resources. It is hard to get those specific questions answered, which then hinders your progress by ignoring problems that you may be having with your playing. When you practise your playing with a system/videos/apps, you do this most often in your bedroom or at home by yourself. That is understandable. However, if you have any long-term goals of wanting to enjoy music. Whether it is being able to play freely, like a musician. Whether that is by yourself or with other people. You want to understand the language of music to these things. Jamming and playing with other people requires musical interactions with other people. There are many benefits from social interaction, such as gaining confidence, improving your rhythm, and understanding how communication works between guitarists. YouTube guitar lessons, books, or DVDs for learning guitar tend to leave players struggling to experience these aspects. They can become shy and unconfident when it comes to playing in front of other people or playing at parties or gigs. Now that you know a few common problems with learning guitar from these various resources, we hope you can resolve these problems quickly. No matter where you are, we always suggest finding a good guitar teacher that can help you resolve these problems. If you are situated in East London, we would love to hear from you and see how we can help you with your guitar playing. If you have been learning online and have experienced any of these problems, we can definitely help you progress much quicker and faster on the guitar. Click the button below, which will take you through to our contact form so we can find out a little more about you and how we can help you through a free introductory guitar lesson.